Gethin Creagh featured in our sixth Sunset Winery exhibition, and continues to use sound as an artform in the KIX FM studio to this day. It is no wonder Kingscote is where we have lived and worked in the arts for the past two decades. What a wonderful privilege to be a part of discovering and revealing the amazing hidden talents of people we have rubbed shoulders with in this community on almost a daily basis. We were especially reminded of this when we saw Gethin Creagh included in the SA Weekender spotlight on the people of Kingscote which aired a couple of weeks ago. Gethin Creagh is a retired film industry insider. 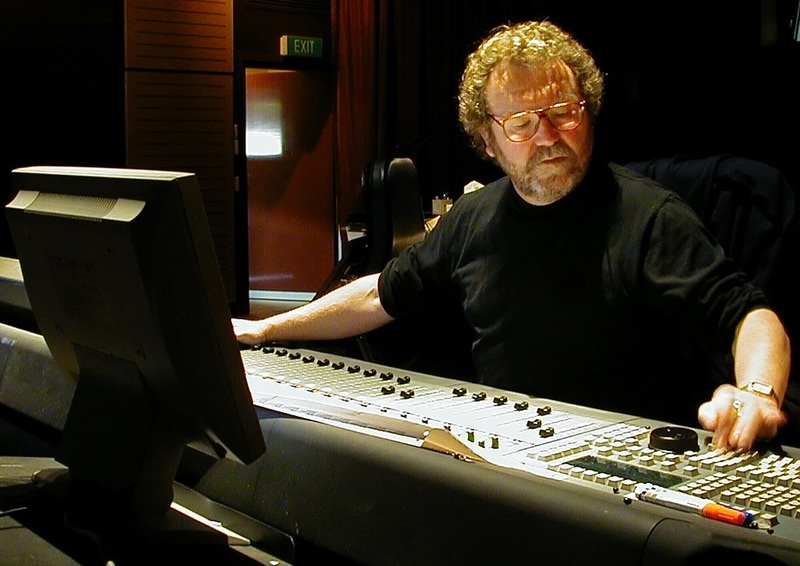 He is an Oscar nominated sound mixer, recipient of numerous motion picture AFI and BAFTA awards and has been responsible for sound mixing for over 130 motion pictures including The Piano and The Lord of the Rings: The Fellowship of the Ring. From our archives – the original invitation for Sights & Sounds at Sunset exhibition where Gethin artfully demonstrated the inexorable link between the two. Gethin chose to build his home nestled within a stand of the island’s narrow-leaf mallee on the edge of the glorious Bay of Shoals. A tiny patch of private wilderness, just ten minutes from Kingscote, and 30 minutes by plane to Adelaide’s international airport. The best of both worlds is how Gethin described his lifestyle, between jobs and international travel, when he exhibited with us at The Sights And Sounds at Sunset exhibition a number of years ago for our sixth Art Feast at Sunset Winery. Whilst he is not a visual artist, clearly Gethin is respected for his creativity at the highest level of his profession. In a wild fusion of art forms we brought together cinematic art with the works of local visual artists synthesized in a display of moving and static imagery. Gethin provided a visual sound backdrop to larger than life oil paintings, animated sculpture, vivid photography, and vector artwork inspired music and rhythms. Ever wonder what it would be like to see a movie with no sound? Sound in movies has become as critical as the visual image. Exhibition goers were mesmerized by Gethin’s artistry in bringing to life sequences of well known movies on split screen audio presentations first without and then with full sound. These days he is making waves of an entirely different kind. Now retired from film work, and an active member of local Radio Station KIxFM. Visitors who tune in are likely to also hear Gethin’s own voice as he broadcasts across the island. Thinking back on what makes Kangaroo Island so special, not simply for those of use who live here, but also for those who come seeking works of art from our community, the attraction is not hard to understand. Kangaroo Island has a tranquility and natural beauty that draws creative people to its shores. Many talented people pursue a quiet life focussing on their vocation far from the gaze of the public eye, so there is no mystery in the treasure-trove of breathtaking treasures we see every day. Of course Kingscote – the main township – and surrounds are home to almost half the Island’s population. For those who long to live close to urban amenities but surrounded by panoramic sea views, and bounded by tracts of undisturbed bushland, this is the perfect place. Here we can co-exist with resident mobs of kangaroos living on the town’s edges. Let’s face it, Koalas have even been known to wander into the main street from time to time. So many more wonderful island artists have been a part of the Fine Art Kangaroo Island story over the years. Keep an eye out here as we dedicate some time to helping you get to know them from time-to-time.